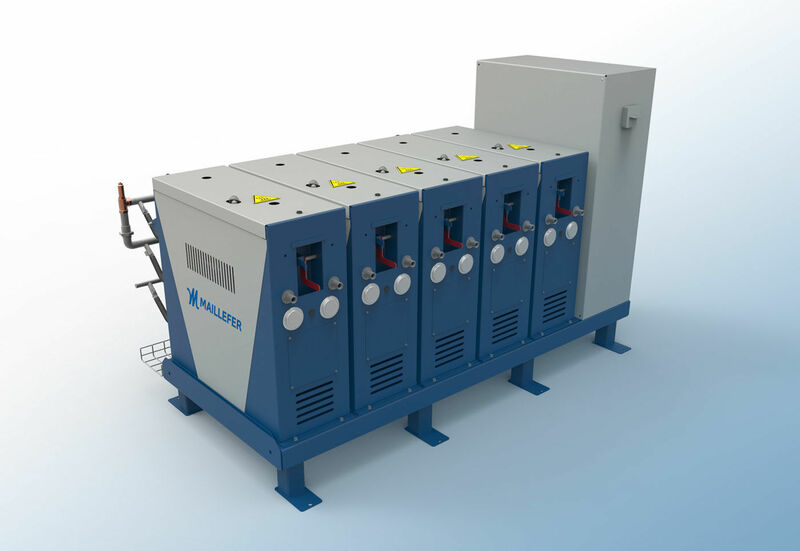 The Integrated Water Tempering Unit IWT is designed to meet all demands of a power cable extrusion process. A reliable, fast and accurate temperature control, in addition to continuous adjusting and monitoring of the extrusion process, is a guarantee for a high quality three plastic layered cable. The unit is a fully integrated part of the line control system. The tempered water circulation of the extrusion screws and the cross head flow channels are controlled as accurately as the individual zones of the plastic insulation extruders. It has an operator-friendly design: a single unit can be replaced while the other units are in operation, and the pressure release from tempering hoses is standard. The Integrated Water Tempering unit contains up to five independent tempering circulations. Typically there are three circulations for a crosshead and one for extruder screw cooling. The unit is developed to control accurately and rapidly the temperature of a crosshead and an extruder screw in Maillefer power cable lines. A high performance, reliability, an easy operation and maintenance are the main features of the IWT. It is used with the Maillefer NXW Cooling Unit (Extruder Water Cooling Unit). It utilizes the same cooling liquid as Maillefer extruders. An internal circulation of the cooling water ensures a proper, stable and reliable source of the coolant. The units are controlled by a Siemens ET200 controller, via Siemens profinet cable and the extrusion line control panel or by its own integrated control panel Siemens KTP600 with a touch screen. The temperature is measured from outlet and return waters using accurate PT100 thermometers.